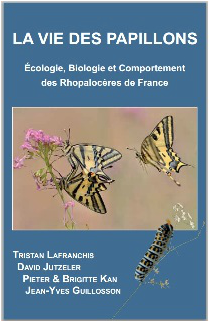 ​Ecology, biology and behaviour of the butterflies of France. An indispensible companion to identification guides, covering life cycles, adaptation to varied and changing environments, relationships to landscapes, plants and other insects (ants, parasitoids, predators), etc. Includes the latest discoveries in fields as diverse as biochemistry, genetics, ecology and the history of science. Each species is illustrated, in more than 2000 photos, mostly unpublished, of the adults, eggs, larval stages, pupae and also habitats. A CD includes a complete list of hostplants with illustrations, a list of parasitoides, distribution maps and a bibliography of 5000 titles, ordered by species. 751 pages, 3000+ colour photos, colour illustrations and colour distribution maps, includes CD-ROM with maps and bibliography. You can purchase this book+ CD-ROM directly from the editor.
. I have received my book today, it is fantastic, thank you very much. I cannot find words to describe my feelings for the content of the book.
. It is indeed a monumental work for the butterflies of France and a model for other countries to follow your steps. Very useful all stages in few pages side by side.
. I will learn more for butterflies from your work. For beginners also is extremely apocalyptic in uncovering the life of all stages. I cannot understand fully the text (my knowledge in your language is low) but I will try hard to learn more just for study the details in life cycle of all species.this is just to give you a note that the wonderfully illustrated book has arrived safely at my university address today. ​. Really a magnificent book to browse through and enjoy!! We quickly scrolled the book page by page and were overwhelmed by the many excellent photographs of eggs, caterpillars, chrysalis, butterflies, some predators and many drawings of food plants. My congratulations and respect for this excellent and informative book, which was surely for you and your co-authors a very time-consuming and painstaking effort.
. One does not need to be fluent in French (the reviewer certainly is not) to appreciate the excellence of this book; the literally thousands of superb photographs are enough to enthral the reader without reading a word of French. I thoroughly recommend this book to all those interested in European butterflies (...) All the species found in the UK are covered. Despite what appears, at first sight to be a high price, it is matched by the many hundreds of first class photographs being the culmination of many years of extremely arduous work.